Celebrate the start of the academic year with the MavsMeet Convocation at 4 p.m. today, Tuesday, Aug. 22, at College Park Center. Radio personality and alumnus Rock T will give the keynote address. Stick around for live music, games, and fun at the AfterParty. See the Maverick Stampede schedule. Half of the West Campus Parking Garage will open to students today, Tuesday, Aug. 22. The remaining half will open in December. There is no overnight parking in the new garage. All vehicles must leave by 12:30 a.m. during the garage's remaining construction. Parking permits for 2017-18 are available online. 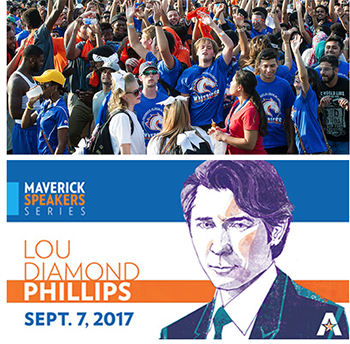 Go to uta.edu/pats and log in to MavPark to obtain a permit. Student organizations are encouraged to host an information table at the Maverick Cookout Featuring the Activity Fair Day on Wednesday, Aug. 30, on the University Center mall. Register online.